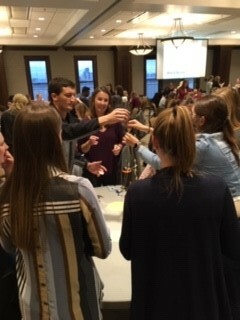 More than 200 first year graduate students in the Colleges of Health Sciences and Pharmacy participated in an inter-professional seminar focused on understanding the roles and responsibilities of each discipline as part of an inter-professional team to maximize patient outcomes. As part of this event, students worked on teams to create the tallest structure they could using spaghetti, string, tape and a marshmallow. Approximately 190 second year graduate students from the Colleges of Health Sciences and Pharmacy also participated in an inter-professional seminar which explored the importance of communication and the risk of medical errors when there is miscommunication. These inter-professional events enable students to learn from and with students from other disciplines who will be their professional colleagues when they graduate.